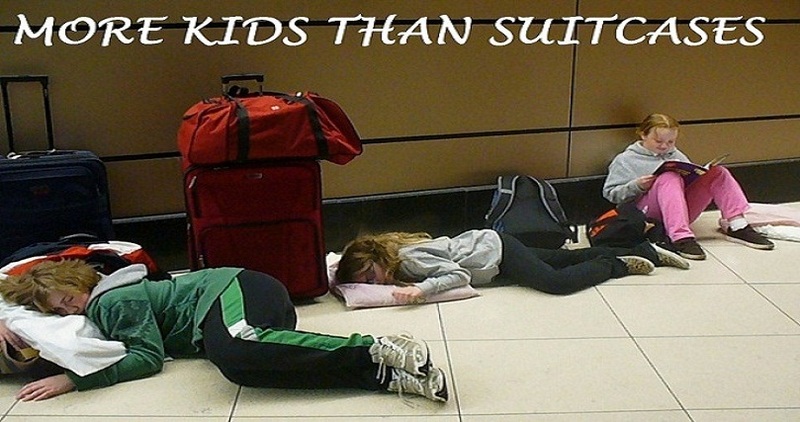 MORE KIDS THAN SUITCASES: Could You Travel With Us? If you travel much, you probably hear it. "Can I hide in your suitcase?". We get asked a lot, and to be honest, I'd be more than happy to smuggle a few people along in my suitcase, but since we already know how little suitcase space the husband is allowed, it's just not going to happen in my section (If you can fit in a carry on, send me a separate message). #1 - Can you sleep anywhere? Cheap flights mean early flights, late flights, or sometimes both if there's a very long layover jammed in between the two. A travel day of 24 hours isn't that rare by our standards, so you'd better be prepared to catch up on your sleep wherever the opportunity presents itself. That means cars, that means planes, and most frequently, that means airport floors. Car rental center floors are also acceptable, as demonstrated in the title picture at the top of every page. #2 - How long can you survive on Starbucks? When we're traveling, our version of breakfast, lunch, and dinner is quite often called tall, grande, and venti. You'd think that would be an expensive way to feed ourselves, but we pretty much have an endless supply of Starbucks gift cards floating around in Lori's purse. At least that's what it seems like to me. I'm not brave enough to actually go in there and see what she has stored inside. As long as the frappuccinos keep coming, I'm not asking any questions. #3 - Can you handle getting lost? Oh it's going to happen. On most people's road trips the most frequently heard phrase is probably "Are we there yet?". On ours, it's "recalculating". To our family, it's not really a vacation until we've taken a serious wrong turn somewhere. Whether it's going the wrong way on a one way street in Honolulu, or taking an unplanned tour through Compton at 3am (Uhhh kids...you might want to put those iPads away for a few minutes here), if you stress over wanderings from the planned route, you probably won't enjoy traveling with us. #4 - How fast can you log in to Wi-Fi? We do NOT pay for roaming charges while we're traveling, so unless you want to wait until you get back to the hotel, you'd better be good at finding Wi-Fi on the move. Any red light in traffic is a chance to tap into a random Wi-Fi connection, normally just to find out where we are and how we get out of here. My kids phones have now been logged into so many different Wi-Fi locations that a drive down the main street of town results in a constant barrage of bings and bleeps as their phones automatically log in and out of recognized networks. #5 - Do you know the words? A quick thank you to my wife for making me realize that I may as well go ahead and use this video, since it's been plastered all over the internet via her Facebook page anyways!